Sheri's debut novel, Deep Doo-Doo won the 2015 National Indie Excellence Award for Crime Fiction. Two follow-ups are in the works to complete the trilogy about a young newspaper reporter in Santa Rosa, CA. Click on DEEP DOO-DOO for more information. This memoir writing class meets weekly at Friends House in Santa Rosa, CA. Stories written by these authors are featured on the MEMOIR WRITING BLOG. This how-to memoir writing book by Sheri Graves features stories written by Senior Authors of Santa Rosa as examples of style and structure. The book is scheduled for publication in 2018. 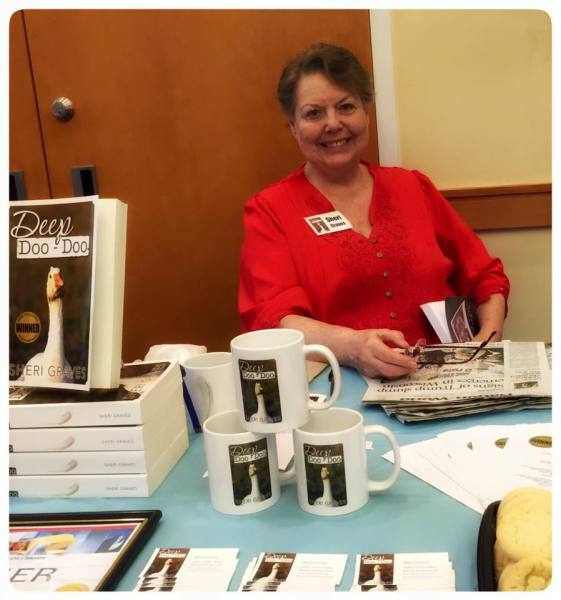 Above, in a photo by David Dodd, Sheri greets book (and mug) buyers and attendees at the 2nd Annual Local Authors Showcase (April 2, 2016 at the Rohnert Park Public Library). This class was founded at Friends House in 1985 by the late Geets Vincent, who continued as instructor until she had a major stroke in 2010. The class was sponsored by Santa Rosa Junior College until 2011 when budget constraints led to the temporary end of the entire Older Adults Program. Later, when SRJC reinstated some memoir/autobiography classes, this class was not among them. Senior Authors voted to become independent and self-funded. The class hired former Press Democrat reporter Sheri Graves as writing coach in 2013. This class remains the oldest continually-meeting senior writing class in Santa Rosa. The 35 students range from 45 to 98 years of age and only five are residents of Friends House. Anyone may join the class. Drop-ins welcome. Sheri does a pre-class edit and critique of any story emailed to her by noon Tuesday before the Thursday morning class. Many stories from this class are published on the memoir writing blog maintained by Sheri on this website. Selections of those stories published on the blog will appear in an upcoming book, Memoir Writing in a Flash: How-to Writing Tips Plus Real Life Personal Stories, in which Sheri explains the concept of “Flash Memoir” and discusses various styles of memoir writing, story structure, paragraphing, basic grammar issues, how to use dialogue and inner monologue, the advantage of descriptions and visuals, the importance of emotions, critical use of tension, how to stay on focus, how to use biography within memoir, and other how-to writing tips. Stories from the class are used as how-to examples.